True enough, even a superstitious man has certain inalienable rights. He has a right to harbor and indulge his imbecilities as long as he pleases, provided only he does not try to inflict them upon other men by force. He has a right to argue for them as eloquently as he can, in season and out of season. He has a right to teach them to his children. But certainly he has no right to be protected against the free criticism of those who do not hold them. He has no right to demand that they be treated as sacred. He has no right to preach them without challenge. Did Darrow, in the course of his dreadful bombardment of Bryan, drop a few shells, incidentally, into measurably cleaner camps? Then let the garrisons of those camps look to their defenses. They are free to shoot back. But they can’t disarm their enemy. What should be a civilized man’s attitude toward such superstitions? It seems to me that the only attitude possible to him is one of contempt. If he admits that they have any intellectual dignity whatever, he admits that he himself has none. If he pretends to a respect for those who believe in them, he pretends falsely, and sinks almost to their level. When he is challenged he must answer honestly, regardless of tender feelings. That is what Darrow did at Dayton, and the issue plainly justified the act. Bryan went there in a hero’s shining armor, bent deliberately upon a gross crime against sense. He came out a wrecked and preposterous charlatan, his tail between his legs. Few Americans have ever done so much for their country in a whole lifetime as Darrow did in two hours. The Scopes Trial was the first trial to be broadcast on radio, allowing the whole of the country to hear Darrow’s legendary challenge to Bryan and Mencken’s brilliant mockery. 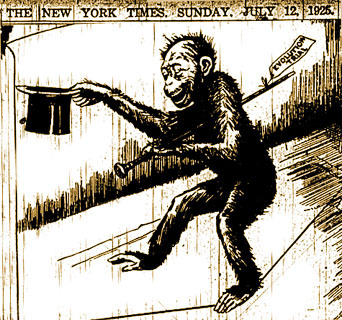 But the Monkey Trial was not all victory, for it left in its wake the belief that science could be tried in the court of law, and that public opinion could trump scientific truth.